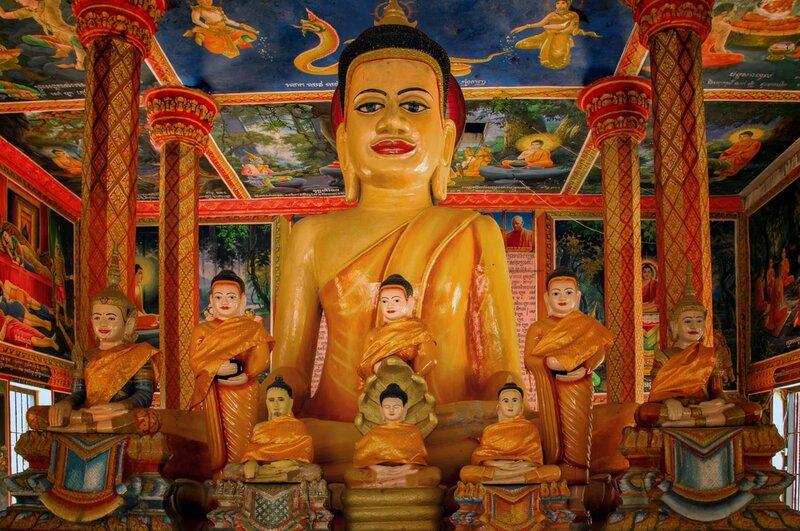 Sharing borders with Thailand, Vietnam and Laos, the Kingdom of Cambodia is steeped in history and rich in culture. Ninety percent of the nation’s 15 million inhabitants are from the Khmer ethnic group which can trace its roots back over 4000 years. 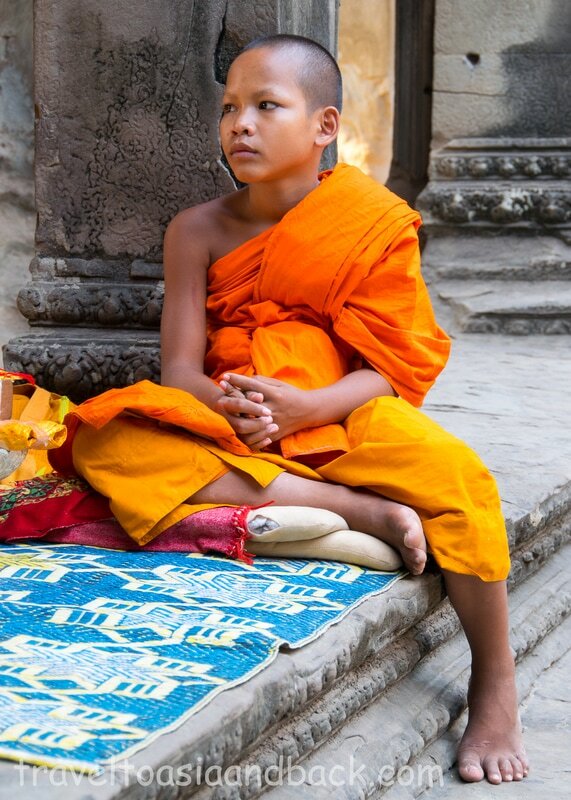 Predominantly Theravada Buddhist, the Khmer people practice century-old traditions in which Buddhism plays an import role. 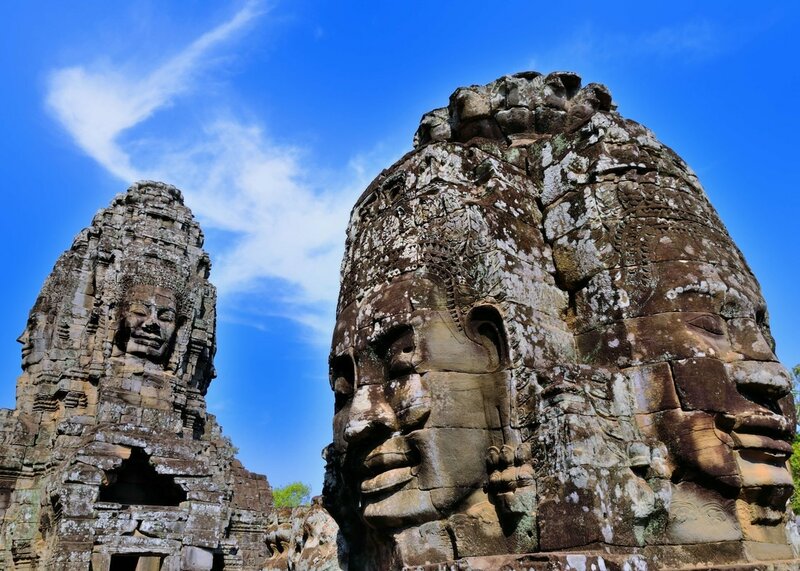 The country is probably best known for the ancient temple complex of Angkor Wat and the Angkor Archaeological Park, a UNESCO World heritage site. Considered to be one of Southeast Asia’s most important archaeological sites, it covers an area over 154 square miles (400 km2) and attracts over two million visitors per year. The Cambodian people are understandably very proud of Angkor; a depiction of the famous temple has graced the nation’s flag since 1850. Exploring extraordinary temples is only one activity that draws visitors to “The Kingdom of Wonder”. Cambodia has beautiful and diverse natural scenery which includes turquoise seas, white sand beaches on tropical islands, hills, mountains, valleys, plains, rain-forests and waterfalls. A partial list of activities that visitors participate in includes SCUBA diving, trekking with elephants, visiting museums, taking cooking classes and zip lining. Devastated by nearly 30 years of war, mass tourism was virtually unknown in Cambodia until the late 1990’s. Between 2000 and 2006 the number of travelers arriving in Cambodia quadrupled and in 2015 4.7 million tourists visited the Kingdom. The Khmer people are warm, friendly and genuinely welcoming to foreign visitors. 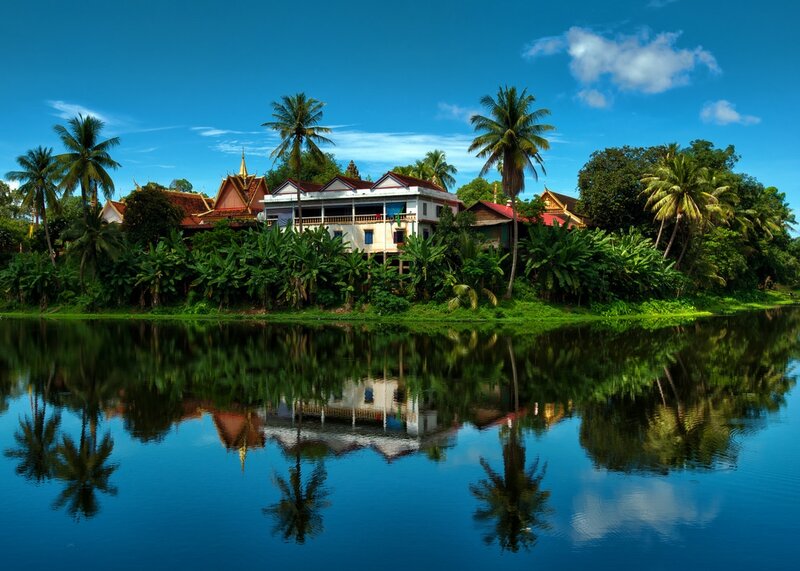 Independent travelers will find that Cambodia is easy and economical to tour. With international airports in Phnom Penh (PNH) and Siem Reap (SRE) Cambodia can easily be reached by air from many Southeast Asian hub cities such as Bangkok, Singapore, Ho Chi Minh City, Vientiane and Kuala Lumpur. Outside of Southeast Asia flights are available from Hong Kong, Seoul, Taipei and a number of Chinese cities. There are also a handful of flights from Tianjin and Hangzhou, China to Sihanoukville (KOS), Cambodia’s port city. The country can also be reached overland from Thailand, Vietnam and Laos. A number of companies offer inexpensive bus trips connecting popular cities such as Bangkok and Siem Reap. Popular with backpackers and budget travelers, this particular route is a long one and consumes precious vacation time. Given that airlines such as AirAsia offer very low fares, we strongly recommend checking plane ticket prices on line before committing to an overnight bus trip. It is also possible to travel by train from Bangkok’s Hua Lamphong station to Aranyaprathet, Thailand and enter Cambodia at the Poipet border check point. From Poipet travelers can continue on to Battambang, Siem Reap or Phnom Penh by bus or taxi. Cambodia can also be reached by boat from Chau Doc, Vietnam. The five-and-a-half-hour trip to Phnom Penh is quite interesting and clearing in and out of immigration is very easy. This route is very convenient for travelers planning on touring Vietnam’s Mekong Delta region. Tickets for the boat can be booked through the Mekong Vietnam website. With the exception of nationals from ASEAN countries, all visitors to the Kingdom are required to obtain tourist visas. Visa on arrival is quick and easy and can be acquired at all airports and land border crossing points. Currently (September 2016), the fee is $30 USD for a thirty-day visa which can be extended for an additional 30 days. With the completed application, visitors will need to provide immigration officials with one passport-sized photograph and US dollars which are in good condition. We recommend only bringing dollars into Cambodia which are new and in pristine condition. This is particularly true for 100 dollar bills which are often closely scrutinized before being accepted. Cambodia also offers tourist visas on-line through their e-Visa website. Visitors utilizing this service are charged an additional $7 USD processing fee. Travelers should note that not all nationalities are eligible for this service and e-visas are not accepted at Sihanoukville Airport or certain land border crossing points. With its discount domestic airlines, and modern highways, Cambodia is very easy and affordable to travel around. Budget travelers and backpackers will appreciate the fact that most of the country’s most popular destinations can be reached inexpensively by bus or van. The main tourism hot spots will all have travel agencies with English-speaking staff who can organize plane, bus tickets and tours for a very modest fee. In the past few years the Kingdom has made significant improvements to its highway system; bus travel in Cambodia is generally safe and comfortable. There are numerous bus companies operating in the country, some of which cater more towards tourists and travel to and from the country’s most popular destinations. Giant Ibis is one of the most highly regarded bus companies and runs the well-traveled routes between Phnom Penh and Siem Reap, Kampot, Sihanoukville and Ho Chi Minh City, Vietnam. One of the advantages of tourist buses in Southeast Asia is that they usually pick up passengers at their hotels which saves a few dollars on taxi fares. Bus travel is a vital transportation method for locals as well and even some of the country’s smallest towns are on bus or van routes. Often crowded and uncomfortable, local buses are inexpensive and a great way to meet and interact with local people. Tickets can be purchased through bus company offices, travel agencies or, in some cases, roadside ticket sellers. Cambodia is still very much a developing nation which relies heavily on foreign economic assistance and investment. Until this year (2016) passenger train service in the country was nonexistent. Recently Royal Railways began rail service between Phnom Penh and Sihanoukville, with stops in Takeo and Kampot. The company is currently in the process of rehabilitating the old railway connecting Phnom Penh and Poipet on the Thai border, with the goal of offering passenger service on this route.